To all our friends and neighbors who use their fireplace and wood stoves to heat your homes in the winter season, the Upperco Volunteer Fire Company would like to pass on the following Top 10 tips in preventing chimney fires. We have responded to a number of “Chimney Fire” calls recently in our community, Our wishes are that we would much rather see you at one of our many fun community events & activities this year, than see you on the scene of a preventable fire at your home. Please stay safe, warm and cozy this winter! 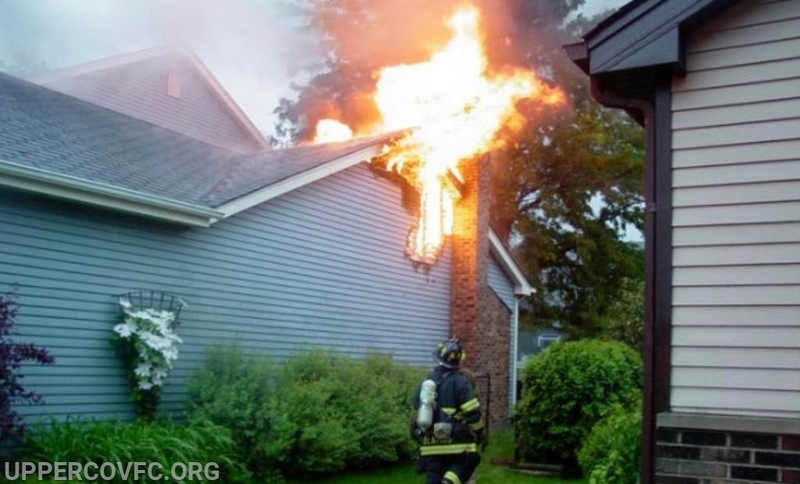 Nearly all residential fires originating in the chimney are preventable! 1. Have your chimney inspected and cleaned at least once a year by a professional, and more than that if creosote builds up on your chimney walls more rapidly. This is a $100 to $200 price that is worth paying for. 2. Between the professional inspections and cleanings, be sure to check and monitor your wood-burning fireplace for signs of buildup or other problems. 3. Your chimney has a cap on the top of it with open sides (usually covered in mesh to keep rain, birds, squirrels, other animals, and debris out). Make sure this cap is regularly inspected and replaced when necessary. 4. Check the interior of your fireplace for creosote buildup. It is flammable, therefore too much buildup is a fire hazard and should be cleaned away with a creosote remover as soon as possible. 5. Also, watch for soot buildup. Soot is softer than creosote, but is also flammable and should be cleaned up regularly. 6. If possible, burn hardwoods like oak, maple, ash and birch. These woods burn hot and long, are cleaner to handle, and have less pitched and sap. They also tend to leave less creosote buildup but can be more expensive. 7. Any time there is smoke indoors from your fireplace, troubleshoot and immediately correct any problems you find. Possible causes are a dirty chimney, soot or creosote buildup, and other debris, a sample that isn’t open or fully opened, or wood not building completely. 8. Consider installing a stainless steel liner that will withstand even the highest temperatures and will keep the embers contained. 9. To improve your fireplace’s efficiency, you should also consider installing heat-proof glass doors to protect against heat loss and a fan or blower to direct heat into the room. The doors can also keep embers from entering the interior of your home. If you do get the glass doors, clean them regularly with a paper towel and glass fireplace door cleaner. 10. Clean the interior of your fireplace, including the floor, regularly. Sweep or vacuum up cold ashes. Wear a dust mask and gloves when cleaning your fireplace. Proper home maintenance requires constant vigilance. Chimneys, in particular, require upkeep. A chimney that is dirty, blocked or in disrepair can inhibit proper venting of smoke up the flue, and can also cause a chimney fire. Nearly all residential fires originating in the chimney are preventable, according to the New York State Homeland Security and Emergency Services. The Chimney Safety Institute of America recommends looking for these signs of a pending chimney fire: a loud cracking and popping noise; a lot of dense smoke; or an intense, hot smell. Here are 10 tips to prevent chimney fires, courtesy of American Heritage Insurance Group. Chimney fires are extremely common in the winter time. When the temperatures are low and you want to save on your heating bill, many people turn to a fireplace to save some extra pennies. What many people don’t realize though is just how dangerous a fireplace can be. Fireplaces are generally safe heating sources as long as they are properly maintained and monitored by the homeowners. One risk some homeowners don’t consider with their fireplace is a chimney fire. These types of fires may be hard to notice until it is too late. Read below to find out the 10 tips to help you recognize a chimney fire. If your chimney fire didn’t burn down your house, consider yourself lucky! Below are warning signs to tell if your chimney has experienced a small fire in the past. These signs will help you know if your fireplace is unsafe to use, needs to be cleaned or even have the damages repaired. In conclusion, chimney fires can pose a serious threat to you and your family this winter season. Be aware of the warning signs to keep everyone safe and free from harm. American Heritage Insurance Group is an independent property and casualty insurance agency offering personal lines insurance, commercial lines insurance for small and medium sized businesses, farm insurance, and several specialty lines. We have offices located in Cincinnati, Milford, and Springfield, Ohio.